My family loves Punjabi food and i cook chickpeas at least once a week on our predesignated vegetarian days. My daughter who is usually averse to vegetables, gorges on chole(chickpea curry) and puris(deep fried Indian bread). I am always searching for different ways to make it. Usually I cook it in an onion-tomato gravy or in a spinach gravy base but this time discovered another gem. This recipe is from a celebrated Punjabi chef Harpal Singh. Original recipe is here. This recipe gets ready in a jiffy. I have reduced the amount of ghee as per my family's needs but don't' skip it as the ghee elevates the dish to a new level. I am usually very paranoid about the amount of fats that go into my food but for this recipe i gave in and used ghee though much less than the recipe asked for. This recipe also omits onions and garlic but taste awesome. 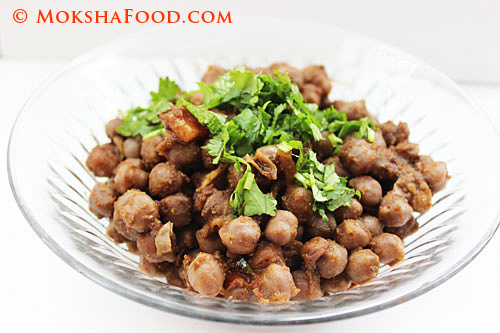 The soaked chickpeas should be boiled with 6-7 slices of dried amla. Amla gives a nice dark color and tangy taste. If you don't have Amla, you can drop a couple of tea bags to get the dark color. In a big bowl, take only the boiled chickpeas. The water can be reserved and reused as stock. It is not required in this recipe as its a dry dish. Add all the masala pdrs and salt to it and mix well. Put the seasoned chickpeas in a large wok or pan. Add chopped tomatoes, chilies and ginger. In another small pan, melt ghee. Heat it to a smoking point. 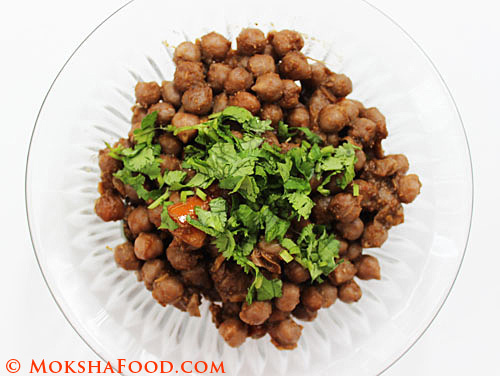 Add the ajwain seeds and immediately toss it into the seasoned chickpeas. Cook this chickpeas for about 5 mins just for the spices to blend well. No need to mash the tomatoes. Serve hot with puris or a bread of your choice.